Get a hubiC folder on all your computers and sychronise content across them all. Anything you drag and drop into this folder is then stored in hubiC so that you can access it from your tablet, smartphone or via the web application. If you make changes to a file on your computer, it will then be automatically updated across your other devices. File and folder sharing is child's play on hubiC. 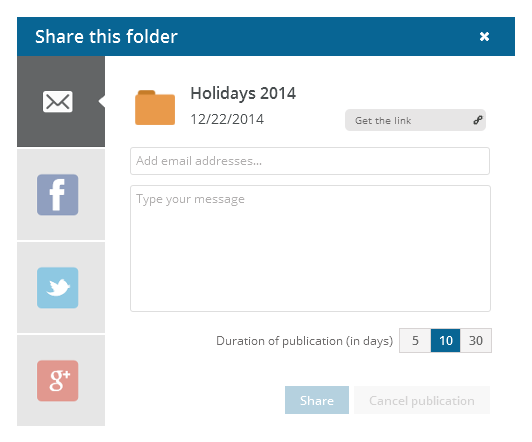 Create a sharing link and send it to your family and friends. They will then be able to access the shared files from any web browser. What's better than having a storage and sharing facility in one place, so you can work on a project with others, or even share videos? You can backup a huge quantity of data on hubiC using the "Backup" option. With the desktop application you can create backups of your folders on your computer without having to synchronise them. You can also create backups using the mobile and tablet applications. 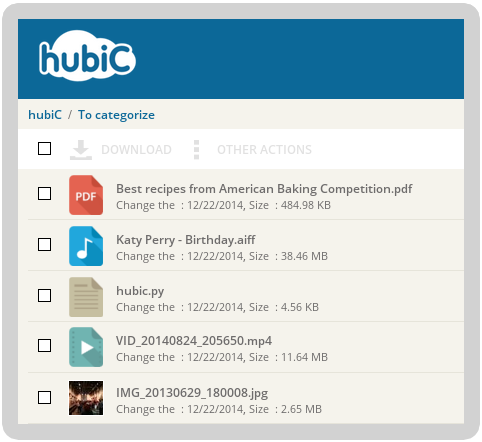 hubiC accepts all file types in all sizes, so you can remotely back up all your photos, videos, music and documents. Log in to your storage space in just a few clicks to create folders, delete or move files or even publish them online. You have full control of your online storage platform. Technicians are on site 24/7, 365 days a year to keep your servers in top condition and make sure they stay available. The desktop application is available for Windows, Mac and Linux. Mobile apps for iOS (iPhone/iPad), Android and Windows Phone 8. Access the web application from a simple web browser. Transfers between your devices and the OVH servers are secured using the SSL protocol and OVH provides the best infrastructure to guarantee optimum transfer speeds (depending on the capacity of your internet connection). Each document placed in hubiC is stored in OVH.com datacentres. Data is backed up with permanent redundancy to handle any hardware faults (outage, data corruption for example), thereby ensuring the integrity of your data. Only you can access your data with your username and password.